CLASSIFICATION F.C.I. : Group 6 Scenthounds and related breeds. BRIEF HISTORICAL SUMMARY: The Grand Basset Griffon Vendéen is derived, like all bassets, from hounds of superior size, in this case the Grand Griffon. The first selections were made at the end of the 19th century by the Comte d’Elva who was looking for subjects with «straight legs». But it was Paul Dezamy who was especially responsible for fixing the type. He understood that in order to catch a hare, dogs of a certain size were needed. He fixed that size at about 43 cm. Today used primarily when hunting with a gun, it is capable of hunting all furry game, from the rabbit to wild boar. 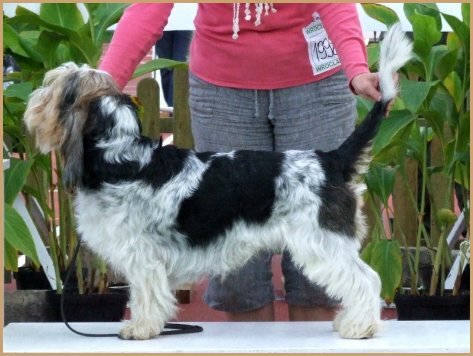 A team of Grand Bassets won the 5th edition of the European Cup for hare. Behaviour: Fast, well voiced, a passionate hunter; courageous, loves bramble and scrub. Leathers: Supple, narrow and fine, covered with long hair and ending in an elongated oval, well turned inwards. Low set, below the eye. They must be able to reach beyond the end of the nose. Back: Long, broad and really straight, never saddle-backed, and starting to arch its junction with the loin; withers very slightly protruding. Loin: Solid, well muscled, slightly arched. Flank: Rather full, belly never tucked up. Shoulder: Long, clean and oblique. Forearm: Thick, wrists (carpus) should never touch. Thigh: Strongly muscled but not too rounded, bone structure and articulations very solid. Hock: Wide and angulated, must never be straight. Seen from the rear, it should not appear turned outwards or inwards. GAIT / MOVEMENT: The dog in action must give an impression of resistance and ease; the movement must be free and harmonious. HAIR: Hard, not too long and flat, never silky or woolly. The fringes should not be too abundant; the belly and inside of the thighs must not be bare; eyebrows well pronounced but not covering the eye. COLOUR: Black with white spotting (white and black). Black with tan markings (black and tan). Black with light tan markings. Fawn with white spotting (white and orange). Fawn with black mantle and white spotting (tricolour). Fawn with black overlay. Pale fawn with black overlay and white spotting. Pale fawn with black overlay. Traditional names: hare colour, wolf colour, badger colour or wild boar colour. Males - from 40 to 44 cm, Females - from 39 to 43 cm. With a tolerance of 1cm more or less. - Depigmentation of the nose, lips or eyelids. - Leathers set high, short, insufficiently turned in or lacking hair. - Too long or too short. - Insufficiently dense, fine hair. - Aggresive or overly shy. - Prognathism (overshot or undershot mouth). - Wall eye. Eyes of different colours (Heterochromia). - Lack of room in the sternal region; ribs narrow towards the lower part. - Crooked or half-crooked forelegs. - Self-coloured coat black or white. - Size outside the standard. - Noticeable invalidating fault. Anatomical malformation.